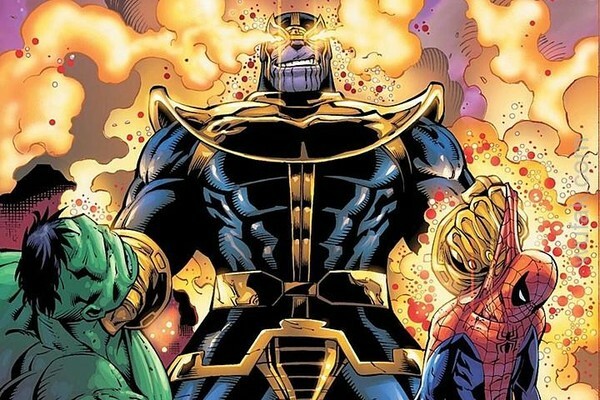 The Top 10 Thanos Appearances- Geek Culture Countdown Podcast! Introducing a new podcast to the Geek SideShow lineup- we’re taking a peek into geek culture and counting off our Top 10 fandom favorites. Let Your Geek SideShow presents… Geek Culture Countdown! This week, Susan and Kitty assemble the Top 10 Thanos Appearances in Marvel Comics! Listen to the full episode on below. Be sure to subscribe to the podcast on iTunes and Youtube, and leave a 5-star review if you enjoy the content! Two humorous instances of Thanos getting bested by animal powers- In the Great Lakes Avengers X-Mas Special, Squirrel Girl took down the Mad Titan across the span of two mini-stories. Her victory was never explained, but Uatu the Watcher confirms she took down, “the REAL Thanos”. Squirrel Girl earned the nickname ‘the Anti-Life’ from her many triumphs. In a quest to gather the Infinity Stones, Thanos crossed paths with the Pet Avengers, led by Lockjaw the dog. Thanos attacked and killed Ms. Lion the dog, but the Pet Avengers have their revenge when they use the Infinity Stones to banish Thanos to an alternate dimension. This infamous mode of transportation appeared in Spidey Super Stories #39, in a funny and kid-friendly story. While Thanos tried to take the Cosmic Cube from The Cat, he ends up dropping it and getting arrested by NYPD officers. The Thanos-Copter hasn’t appeared in any stories lately… is it too much to hope for an MCU appearance? From Thanos #14, this moment actually didn’t come to pass. In this series, Thanos meets an alternate version of himself who reveals that the villain was going to be named Dione, but his mother Sui-San went mad at the sight of her deviant son, and named him Thanos instead. Drax was always destined to kill Thanos. In Annihilation #4, readers got one of their first looks at a major Thanos death moment- Drax the Destroyer rips out Thanos’s still-beating heart. While seemingly heroic, this act actually ruined the heroes’ chances at surviving against Annihilus, whom Thanos was going to double-cross. This was the first time Thanos was seen in the Marvel Cinematic Universe- he appeared in a mid-credits sequence for the 2012 Avengers film, sporting his signature grin. His arrival signaled the start of bigger plans, culminating in the upcoming Avengers: Infinity War film. From Avengers Annual #7, Thanos finally got the better of Adam Warlock in a battle against the Avengers. Warlock has been one of Thanos’s greatest foils in the Marvel Universe since his inception, so to see Thanos defeat his foe (who was later revived by the Soul Gem) was pretty monumental at the time. From the Infinity Gauntlet storyline, this appearance features Thanos and Cap in a one-on-one fight at the end of the universe. Captain America delivers the famous line, “As long as one man stands against you, you’ll never be able to claim victory,” as Silver Surfer steals the Gauntlet. Thanos angrily backhands Captain America, whose neck is instantly broken. Thanos’s appearance was a major incident in the 2016 series Civil War II. After the Avengers use an Inhuman’s power of precognition to ambush the Titan, War Machine is killed in the battle and She-Hulk is put into a coma. His attack was devastating, and called into question whether the Avengers could save more lives by knowing about crimes before they happened, or if it would simply lead to more casualties. From Infinity Gauntlet #1, this appearance chills fans to this day as they remember Thanos’s first action after assembling all the Infinity Stones. He wants to impress Mistress Death, so he makes an offering- and eliminates half the universe with a snap. From Captain Marvel #33, Thanos wipes out half the Earth with the Cosmic Cube. Mar-vell makes a sacrifice to destroy himself, the cube, and the Mad Titan. Mistress Death laughs at Thanos’s failure, showing readers for the first time that Death could not be courted, no matter how hard Thanos tried. This iconic moment from the cover of Infinity Gauntlet #4 takes the #1 spot on our list. This cover transformed Thanos from a “cool bad guy” to a genuine, terrifying Marvel villain. Every hero of the Marvel Universe attacks him in this issue- and Thanos welcomes the challenge. Did you miss any of our previous episodes, including Top 10 Detectives and Top 10 Cats? You can check out the full Geek Culture Countdown podcast on iTunes. Keep an eye out for new episodes and more ways to listen coming soon. What topics would you like to see covered in upcoming episodes? Let Your Geek SideShow and tell us in the comments!